If you're like most people, you are still unaware of what BitCoin is and why you should start using it. The simplest way to describe it, is as another type of currency. Just like there are US Dollars, British Pounds, French Francs, or German Deutsche Marks, there is Bitcoin. The main difference from traditional currencies is that Bitcoin is not country specific, and it is digital. These and other qualities make it a more efficient medium for the exchange of value. PowerMyData and Bitcoin both use block chain technology to provide a verifiable distributed record of digital events. Combined with high encryption, the technology enables a low cost, decentralized solution to better secure data and privacy. Because it is low cost, it also facilitates more frequent and efficient payments to service members. Using Bitcoin as a payment option can greatly increase efficiency of payments which means the members who use it keep more of their money. Using traditional payment services for crowdfunding, PowerMyData results in a loss of your contribution of up to 5% to pay for the transference of money. Using Bitcoin is much more efficient because there is virtually no cost to transfer funds. For this reason, we prefer our members to use Bitcoin. Using Bitcoin to donate is 5% more effective, and PowerMyData returning your profits in Bitcoin means you will retain 5% more. For $1000 in annual earnings, that is $50 more in your pocket. Bitcoin account numbers are super long. For example ours is Our address is thirty four characters long: 1DQXgw9X8mi38vQTR56uRyeNkkPxQsC8Nh. Because they are so long they are hard to type correctly. To make it much easier to send money you can use a Quick Response (QR) code that represents the account number where you want to send money. QR codes are a machine-readable code made up of black & white squares used for storing information that is read by a smartphone camera. The QR code of PowerMyData appears here (below) and on the funding home page. 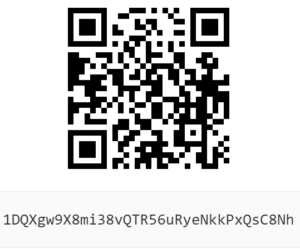 You can use this QR code with your Coinbase bitcoin wallet ( or other vendor wallet) to pledge support for development of the PowerMyData Mobile App and service. Open a separate window/ tab in your browser. Return to PowerMyData and make a pledge of support. Use Bitcoin with PowerMyData to enable us to pay you faster, more frequently, and at less cost.